If there’s one thing we love around here, it’s holiday-themed food. Seriously, what’s better than an ornament shaped cheese tray at Christmas, or fruit displayed in the shape of a turkey on Thanksgiving? Not a lot, until you make it to February, where you have the opportunity to turn everything PINK just for the fun of it. 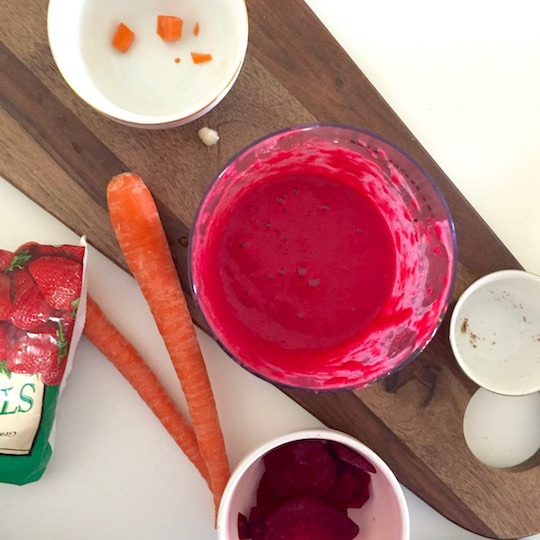 That’s exactly what we’ve done today with our Bump Up the Beet Smoothie! Okay. I know what you’re thinking. 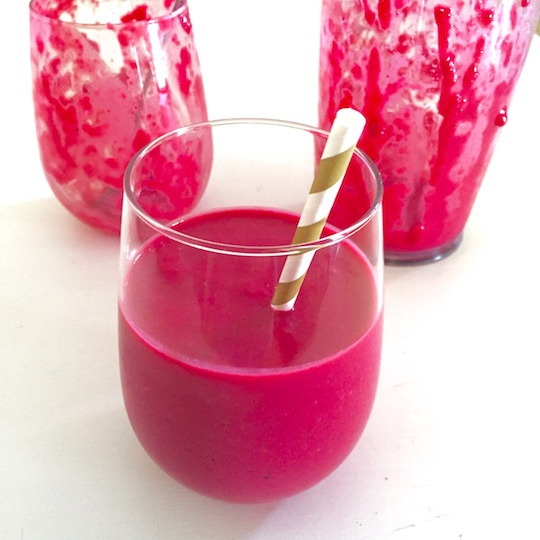 Beets are weird, why put one in my smoothie? It took me twenty some odd years just to TRY a beet, and a little longer to think about putting the things in my smoothie. But, let’s be honest, we all thought the same thing about kale in our smoothies when we started this healthy livin’ thing, right? And look how great that turned out for us! I’ll admit I was skeptical, but oh wow! I slurped it up with a feeling of dread and….it wasn’t terrible?? Not only was it not terrible, but it was actually tasty. Hmph. 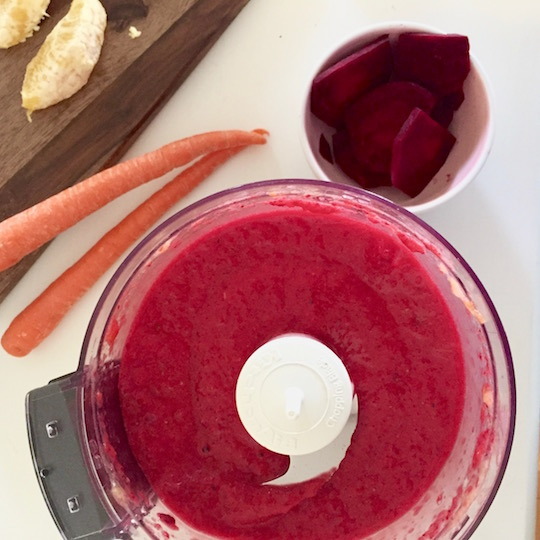 While you can still taste the beets, all of the yummy fruit in this recipe really makes the flavor delicious. Plus, they’re SO good for you (and the little one) so they’re exactly the kind of thing you need to be adding to your healthy and fit pregnancy diet. As if that wasn’t enough, they’re also great anti-inflammatory agents (your aching and swollen joints are practically begging you to make this smoothie), and they’re low glycemic. 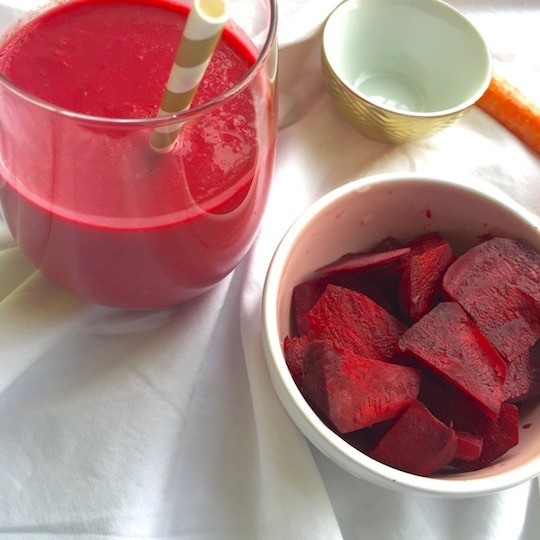 This means that the sugar naturally found in the beets actually helps stabilize your blood sugar, and releases energy as you need it throughout the day. This is compared to processed sugar, which gives you a rush and then leaves you feeling more drained than when you started. And expecting mamas don’t need any of that in their day, am I right? 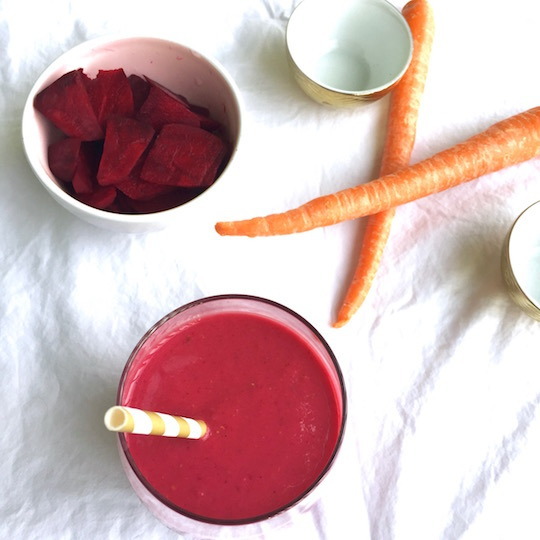 But don’t be fooled, beets aren’t the only thing this smoothie has to offer- all of the ingredients in this bad boy will leave your bump thanking you for the yummy, nutritious goodness you just gave it. I’m talking flaxseed, fresh berries, bananas, oranges, and carrots. There’s nothing fake about this guy- he’s full of REAL, natural, bee(u)tiful ingredients that all offer you and your little one something to feel good about consuming. Get blending and drink up! 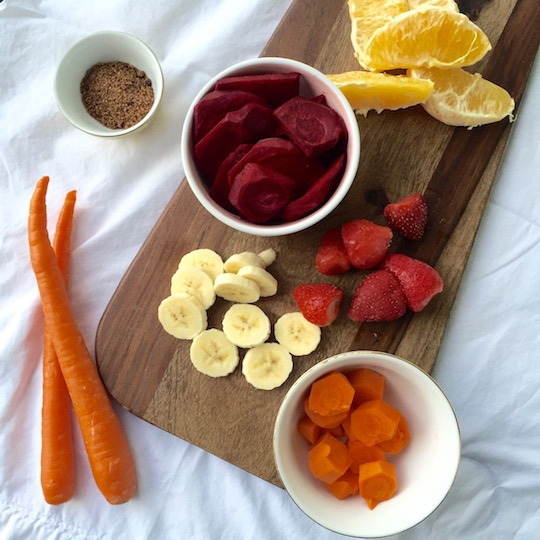 Cut fruit and vegetables up into chunks small enough to be added to a food processor or blender. 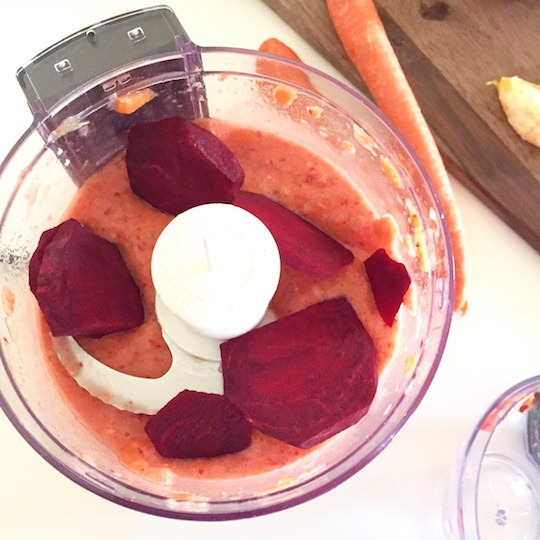 Add all ingredients except beets into the blender or food processor and blend until smooth. Add beets in to taste and continue blending until smooth. 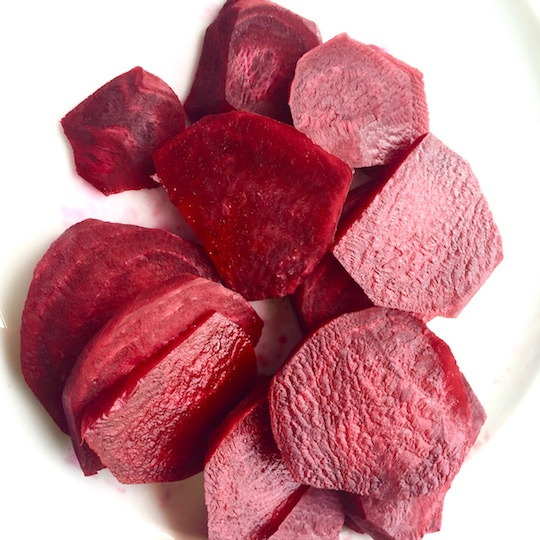 What are some of your favorite recipes that use beets? Find us on Instagram or Twitter (@mumberryfit) and let us know there! We’d love to hear about them! !